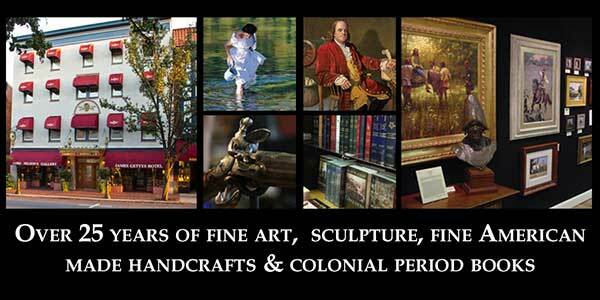 Lord Nelson's Gallery is located in historic downtown Gettysburg, PA. Roughly half of the gallery is devoted to wildlife, nostalgic, and handcrafted art, gifts, and accessories. The other half is what we're best known for, the country's largest exhibitor of Eastern Indian/Frontier art of the French & Indian War period with an equally impressive collection of related books and fine accoutrements. You'll find artwork by John Buxton, Robert Griffing, David Wright, Pamela Patrick White, Carl Brenders, John Weiss, Heide Presse, Dean Morrissey, Jason Tako, Mark Hopkins, Wayne Hyde and more. You'll find their work in the gallery section of the site. Paintings, art prints, artist signings, contemporary accoutrement makers and sculpture. by John Buxton New Book! Download our latest newsletter previewing the History Meets the Arts show.